--- (19.04.2018) - 50 Edición Feria Plaza Mayor. Codes B4ES18 ES01 (Kiosk) & P4ES18 PM18 (Counter printers). Special imprint ' 19-22 abril Madrid '. Pictorial first day cover with two ATMs printed by each machine (4 x Tarifa A). First day special postmarks 'ATM Punto Filatélico' & 'Feria Nacional del Sello'. Intelligent AR (19.04.2018) - 50 Edición Feria Plaza Mayor. Code B4ES18 ES01 (Kiosk). Special imprint ' 19-22 abril Madrid '. Two strips of two ATMs, domestic mail (2 x 2 x Tarifa A), with the fair special postmarks. Intelligent AR (19.04.2018) - 50 Edición Feria Plaza Mayor. Code B4ES18 ES01 (Kiosk). Special imprint ' 19-22 abril Madrid '. Two mint ATMs, domestic mail (2 x Tarifa A). Intelligent AR (19.04.2018) - 50 Edición Feria Plaza Mayor. Code B4ES18 ES01 (Kiosk). Special imprint ' 19-22 abril Madrid '. Two mint strips with four ATMs, domestic mail (2 x 4 x Tarifa A) + first day of issue receipts. Intelligent AR (19.04.2018) - 50 Edición Feria Plaza Mayor. Code B4ES18 ES01 (Kiosk). Special imprint ' 19-22 abril Madrid '. Two mint ATMs, domestic mail (2 x Tarifa A) + first day receipt. Intelligent AR (19.04.2018) - 50 Edición Feria Plaza Mayor. Code B4ES18 ES01 (Kiosk). Special imprint ' 19-22 abril Madrid '. Pictorial first day cover with the two ATMs, domestic mail (2 x Tarifa A). First day special postmark 'ATM Punto Filatélico'. Intelligent AR (19.04.2018) - 50 Edición Feria Plaza Mayor. Code B4ES18 ES01 (Kiosk). Special imprint ' 19-22 abril Madrid '. Two first day covers with the two ATMs, domestic mail (2 x Tarifa A). First day special postmarks 'ATM Punto Filatélico' & 'Feria Nacional del Sello'. Intelligent AR (19.04.2018) - 50 Edición Feria Plaza Mayor. Code B4ES18 ES01 (Kiosk). Special imprint ' 19-22 abril Madrid '. Two domestic first day covers (2 x Tarifa A). Mechanical first day postmark. Intelligent AR (19.04.2018) - 50 Edición Feria Plaza Mayor. Code B4ES18 ES01 (Kiosk). Special imprint ' 19-22 abril Madrid '. 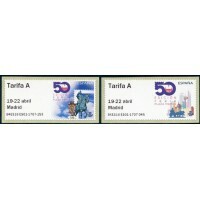 Two domestic first day covers (2 x Tarifa A). First day special postmarks 'ATM Punto Filatélico' & 'Feria Nacional del Sello'. Intelligent AR (19.04.2018) - 50 Edición Feria Plaza Mayor. Code B4ES18 ES01 (Kiosk). Special imprint ' 19-22 abril Madrid '. Set of eight first day cover mailed to different countries (2 x Tarifa A - A2 - B - C) + first day receipts. First day special postmarks 'ATM Punto Filatélico' & 'Feria Nacional del Sello'. Intelligent AR (19.04.2018) - 50 Edición Feria Plaza Mayor. Code B4ES18 ES01 (Kiosk). Special imprint ' 19-22 abril Madrid '. Two pictorial first day covers with the two four-values sets (2 x Tarifa A - A2 - B - C) + first day of issue receipts. Special postmarks 'ATM Punto Filatélico' & '50 Feria Nacional del Sello'. Intelligent AR (19.04.2018) - 50 Edición Feria Plaza Mayor. Code B4ES18 ES01 (Kiosk). Special imprint ' 19-22 abril Madrid '. Maximum card with ATM, domestic mail (Tarifa A). First day special postmark 'ATM Punto Filatélico'. Intelligent AR (19.04.2018) - 50 Edición Feria Plaza Mayor. Code B4ES18 ES01 (Kiosk). Special imprint ' 19-22 abril Madrid '. Maximum card with ATM, domestic mail (Tarifa A). First day special postmark 'IV Centenario de la Plaza Mayor de Madrid'. Intelligent AR (19.04.2018) - 50 Edición Feria Plaza Mayor. Code B4ES18 ES01 (Kiosk). Special imprint ' 19-22 abril Madrid '. Maximum card with ATM, domestic mail (Tarifa A). First day special postmark '50 Feria Nacional del Sello'. Intelligent AR (19.04.2018) - 50 Edición Feria Plaza Mayor. Code B4ES18 ES01 (Kiosk). Special imprint ' 19-22 abril Madrid '. Two mint strips with the four values sets (2 x Tarifa A - A2 - B - C) + first day of issue receipts. Intelligent AR (19.04.2018) - 50 Edición Feria Plaza Mayor. Code B4ES18 ES01 (Kiosk). Special imprint ' 19-22 abril Madrid '. Four pages stamps fair brochure with the two ATMs, domestic mail (2 x Tarifa A). First day special postmarks 'ATM Punto Filatélico' & 'Feria Nacional del Sello'. --- (19.04.2018) - 50 Edición Feria Plaza Mayor. Code P4ES18 CH18 (Philatelic service printers). Special imprint ' 19-22 abril Madrid '. Two mint ATMs, domestic mail (2 x Tarifa A). --- (19.04.2018) - 50 Edición Feria Plaza Mayor. Code P4ES18 CH18 (Counter printers). Special imprint ' 19-22 abril Madrid '. Pictorial first day cover with the two ATMs, domestic mail (2 x Tarifa A). First day special postmark '50 Aniversario Feria Nacional del Sello'. --- (19.04.2018) - 50 Edición Feria Plaza Mayor. Code P4ES18 CH18 (Counter printers). Special imprint ' 19-22 abril Madrid '. Two domestic first day covers (2 x Tarifa A). First day special postmark '50 Aniversario Feria Nacional del Sello'. --- (19.04.2018) - 50 Edición Feria Plaza Mayor. Code P4ES18 CH18 (Philatelic service printers). Special imprint ' 19-22 abril Madrid '. Two mint strips with the four values sets (2 x Tarifa A - A2 - B - C). --- (19.04.2018) - 50 Edición Feria Plaza Mayor. Code P4ES18 PM18 (Counter printers). Special imprint ' 19-22 abril Madrid '. Two mint ATMs, domestic mail (2 x Tarifa A). --- (19.04.2018) - 50 Edición Feria Plaza Mayor. Code P4ES18 PM18 (Counter printers). Special imprint ' 19-22 abril Madrid '. Two mint ATMs, domestic mail (2 x Tarifa A) + first day of issue receipt. --- (19.04.2018) - 50 Edición Feria Plaza Mayor. Code P4ES18 PM18 (Counter printers). Special imprint ' 19-22 abril Madrid '. Two mint strips with four ATMs, domestic mail (2 x 4 x Tarifa A) + first day of issue receipts. --- (19.04.2018) - 50 Edición Feria Plaza Mayor. Code P4ES18 PM18 (Counter printers). Special imprint ' 19-22 abril Madrid '. Pictorial first day cover with the two ATMs, domestic mail (2 x Tarifa A). First day special postmark '50 Feria Nacional del Sello'.